It’s that time again! Graduate classes begin Monday, Aug. 15, in St. Louis, and undergraduate classes begin Monday, Aug. 22 at the home campus in Webster Groves. University community members are encouraged to welcome new and returning students by wearing the “Welcome Students” buttons and displaying the posters. Buttons and posters (single-sided and double-sided) are now being distributed in the Welcome Center, 1st floor, Webster Hall. Please come into the Welcome Center to obtain buttons and posters for your departments and units. Although the buttons and posters have been updated, you are also encouraged to reuse those from previous terms. If your posters are faded and torn, however, please do replace them. 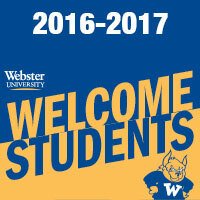 By wearing the buttons and displaying the posters, you are reinforcing to students that Webster University is an inclusive and welcoming campus, and that we are here to help students achieve their personal and professional goals. Enrollment Management & Student Affairs asks you to wear buttons from Aug. 15 until Aug. 26.